This year may not be one that brings Halley’s Comet soaring through the air, but it is one that brings Mark Twain into town. Well, while it may not be the real Mark Twain, it will be a stellar impersonation by Mike Randall. 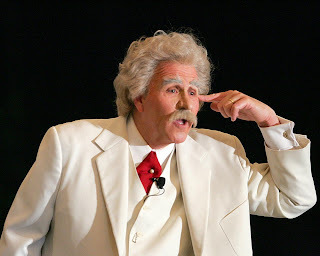 Randall will grace the stage at Bromeley Theater in Blaisdell Hall at the University of Pittsburgh at Bradford Saturday for Mark Twain Live! The show will begin at 7:30 p.m.
Randall’s performance is part of this year’s One Book Bradford season. One Book Bradford is a community-wide reading initiative whose selection for 2010 is “Becky: The Life and Times of Becky Thatcher” by Lenore Hart. Hart herself will be coming to Bradford March 31 to discuss the book. Given the obvious connection between Twain and Hart, the One Book Bradford committee thought it only seemed right to bring “Twain” to Bradford, if only for a night. Randall, who has been doing his Mark Twain show in Western New York since 1972, first became interested back in high school when a friend was doing a Mark Twain bit for a junior class show. Then, he saw Hal Holbrook as Mark Twain. Holbrook, perhaps the best known Mark Twain impersonator, won a Tony for his portrayal of the famed author. At that point, Randall was hooked. “I think what first captivated me about Mark Twain was the humor and the fact that he had an opinion on just about everything and he felt free to express it. Lucky for us,” Randall said. Randall created his Twain character from the ground up based on old folks he knew. He studied material about and by Twain and figured out suitable make-up and costume and learned the words. Despite the longevity, the show has not gotten old for Randall. Randall continues to ad new bits to the show and will again this year, especially since 2010 is the 175th anniversary of Twain’s birth and 100th anniversary of his death. Randall’s “day job” is as a meteorologist and co-host of Good Morning Western New York for WKBW-Channel 7 in Buffalo, N.Y. He started out as a feature reporter, and then Tom Jolls convinced Randall he might be interested in doing the weekend weather. And while he wears a couple different hats in his professional life, he does not find it difficult to balance the two worlds. Randall also does a one-man show of Charles Dickens, a show he took on as a challenge at 50-something to see if he could start from scratch, create a new character and memorize 90 minutes of material. He succeeded. “People who like Mark Twain, me or just like to laugh at some good all-American humor should not miss Mark Twain Live,” Randall said. And besides, Randall has one of the greatest writers in the world working for him – Twain. Randall also clarified his take on why the show may not be for those under 14. “I can tell you that kids don’t always get the jokes,” he said, adding there’s no “blue material” and only mild language. It’s more of a difference in generations than anything else. Tickets are still available for those who enjoy Twain’s humor. Tickets are on sale at the Bradford Area Public Library and at the Bradford Area Creative and Performing Arts Center office. Tickets will also be available Saturday night at the door. The event is sponsored by American Refining Group and CNB Bank.